Jerry Miller, vice president of U.S. refining for Husky Energy, presents a $100,000 check to Joesph Brandesky, Ohio State-Lima interim dean and director, outside the Perry Webb Student Life Building Wednesday. LIMA — Husky Lima Refinery gave Ohio State University at Lima $100,000 Wednesday as a way to support activities at the new Perry Webb Student Life Building. 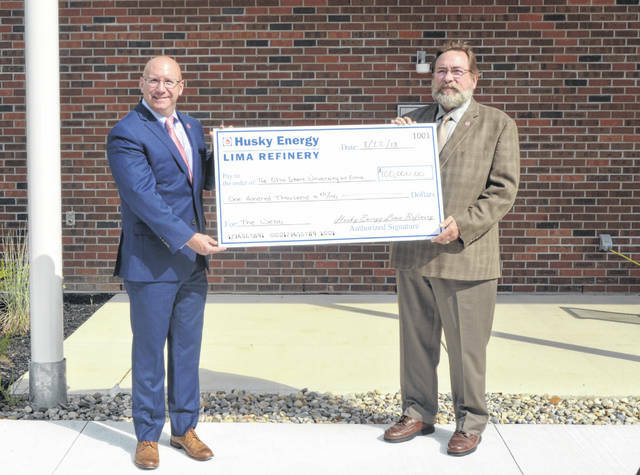 Jerry Miller, vice president of U.S. refining for Husky Energy, presented the check to Joseph Brandesky, interim dean at Ohio State-Lima. The new new recreation center, which opened this fall, is a place on campus for students to study, socialize, work out and relax between classes. The $5.2 million 15,000-square-foot facility is open to Ohio State-Lima, Rhode State College students and members of the community for a fee. In 2013, the refinery donated $75,000 to fund the construction of the new building. Wednesday’s donation was rewarded by plans to name the patio the Husky Lima Refinery Patio. Miller acknowledged that he was extremely impressed with the facility and the work that the university has accomplished over the last few years. “I remember seeing the idea on paper and now seeing it in place, I definitely have to say it was job well done,” said Miller. The Welcome Back Picnic Wednesday was the first event on the patio. Honoring the refinery with the patio’s name, as well as honoring other philanthropic gifts, is expected to be approved by the OSU board of trustees at the end of the month. “We are extremely glad that you all are a part of this process because although we are having a wonderful event opening this section today, the fitness center and the type of services that we offer will go well into the future,” Brandesky said.